Below are the speakers for our 2018 event, which has concluded. See you in 2019. In describing Henry Rollins, the tendency is to try to squeeze as many labels as possible into a single sentence. ``Rollins is many things``, says the Washington Post, ``diatribist, confessor, provocateur, humorist, even motivational speaker...his is an enthusiastic and engaging chatter.`` When he's not traveling, Rollins prefers to keep a relentless schedule full of work, with gigs as an actor, author, DJ, voice-over artist and TV show host to name a few of the roles that keeps his schedule full. Rollins has toured the world as a spoken word artist, as frontman for both Rollins Band and Black Flag. Henry currently hosts a radio show on L.A.'s renowned NPR affiliate, KCRW, in addition to writing weekly columns for the LA Weekly and Rolling Stone Australia. Georg Wurth is a former local politician of Germany's Green Party. He has lead the German Hemp Association (DHV) since its foundation in 2002. The organisation is one of Europe's biggest organizations calling for the regulation of recreational and medical cannabis. With 150,000 Facebook fans and more than 3 million Youtube views, the DHV is powerful on social media. After winning a popular vote, Georg became the first cannabis lobbyist to speak to German Chancellor Merkel about reform. In 2014 Georg's reform campaign idea won one million Euros on a televised show, after which he launched Europe's first cinema spot campaign against prohibition. Bhang is the world's most awarded and distributed cannabis brand. As the Director of Operations, Jamie works with Bhang's licensees in different states and oversees the CHB venture (Cypress Hill Bhang). She came to Bhang on the heels of a successful career investing in real estate. A serial entrepreneur with years of business operations experience, Jamie continues to own a real estate investment firm, a property management company and a real estate portfolio with holdings in three countries. Jamie was named one of the Top Twenty Women in Business by the Billings Gazette and was inducted into the Investors Hall of Fame by the Wealth Intelligence Academy. A ``cannabis kid``, Jamie's father has been a clandestine cultivator since the 1970s in Montana. She currently owns a cultivation operation in Northern California with DJ Muggs and has been a cannabis-friendly landlord to cultivators in Montana for over a decade. She has a B.A. from Vassar College and a Masters in Leadership from the University of Oregon. One of two managing partners at STORZ & BICKEL GmbH & Co. KG, the manufacturer of the first and - to date - only medical cannabinoid vaporizers on the market. He holds a degree in civil engineering and acted as an international development worker in Peru for five years in the late 90s, where he was dedicated to the water and sanitation sector in different cities like Chiclayo, Ayacucho and Tumbes. In 2002 Jürgen Bickel joined Markus Storz, inventor of the VOLCANO Vaporization System as a partner and STORZ & BICKEL GmbH amp; Co. KG was founded. Together, they established a fast growing and international business with highly demanded products. In 2016, STORZ & BICKEL built its S&B Vapor Factor in Tuttlingen, Germany, a town with a reputation for being the nexus of medical technology with nearly 500 medical device manufacturers located there. With the VOLCANO MEDIC and the MIGHTY MEDIC, STORZ & BICKEL provided the only validated application method for the administration of cannabinoids, which was crucial for the overall acceptance of cannabis as medicine. Chuck Rifici is a pioneer of the North American cannabis industry having created and managed opportunities that have positively impacted the Canadian landscape. Chuck has founded and been involved in the creation of some of Canada's largest and most successful cannabis efforts. He is best known for having founded Canopy Growth Corporation (formerly Tweed Marijuana Inc.) and building it into 500,000 square feet of thriving cannabis grow capacity as its CEO. In 2017, along with Canadian cannabis industry leaders, Chuck created Wheaton Income the first cannabis streaming company in the world. Wheaton's streaming partners include production from across Canada coming from partners comprised of licensed producers of cannabis and late-stage applicants. Wheaton's mandate is to facilitate real growth for their streaming partners by providing them with financial support and sharing their collective industry experience. Chuck is also the Founder and CEO of Nesta Holding Co., a private equity firm that creates wide ranging partnerships and brands within the cannabis industry, and Chairman of National Access Cannabis, a care centre chain helping patients access the Canadian federal medical cannabis program. Chuck is a chartered professional accountant (CPA). He obtained his MBA from Queen's University and holds a BASc in Computer Engineering from the University of Ottawa. David Henn is the founder and CEO of Cannamedical®. He holds a degree in Financial Management and has an extensive background in banking. In November 2016 he founded Cannamedical® as one of the first cannabis importers and has since built it up to be one of the leading, GDP certified medical cannabis wholesalers in Germany, supplying a continuously growing network of 1,800 pharmacies. With his entrepreneurial spirit he has ever since been a key driver of its growth, on-going vision and generating strategic partnerships around the globe. Cannamedical® is an expert in the GMP licensing process and helped one of its major international partners to acquire the European GMP certificate. Clint Younge had ten years of Sales/PR, and Management experience before entering the Cannabis industry, where he worked his way up from budtender to assistant manager, to manager and brand ambassador before becoming CEO of MMJ Canada. He is a Director of the Canadian Association of Medical Cannabis Dispensaries, and is an advocate who loves connecting people. MMJ Canada has eight stores (and growing) across Canada, and works closely with the LOST Organization, a mental health division that reflects Clint's main focus with Cannabis. Born in 1957, academic studies of medicine at the University of Cologne. He is running a medical practice, mainly devoted to the medical use of cannabis and cannabinoids. Dr. Grotenhermen is founder and chairman of the German Association for Cannabis as Medicine (ACM), founder and executive director of the International Association for Cannabinoid Medicines (IACM) (www.cannabis-med.org) and chairman of the Medical Cannabis Declaration (MCD). He is editor of the IACM-Bulletin, which is published bi-weekly in several languages and editor of the internet journal CANNABINOIDS, published on the website of the IACM. He is a principal of the nova-Institute based near Cologne and author of many articles, books and book chapters on the therapeutic potential, pharmacology and toxicology of the cannabinoids. The King brothers (Michael and Paul) raised upwards of $40M for cannabis cultivation in California, which they own and operate under the Kings Garden Brand. Their consulting arm, Cannafornia, helps cultivation and retail licensees. Coming from the tech world previously, King was previously named 25 under 25 Entrepreneurs by BusinessWeek. I cover what I learned from hands on experience. Bust myths, give anecdotes, and provide real insight into a day in the cultivation business. I talk about the types of deals that never get funded (that 90% of the market is seeing) and the types of deals that do. How to leverage what you have while banks remain on the sidelines. And I interact with the audience by asking them what funding scenario they have, and walk through the details so everyone is clear on how investors process information. Jamie Shaw is both a former Director and Spokeswoman of the BC Compassion Club Society (BCCCS), and served three terms on the Board of Directors for the Canadian Association of Medical Cannabis Dispensaries (CAMCD), two and a half of those as President, where she lobbied successfully for the first dispensary regulations in Canada. Jamie was a co-founder of the first Canadian chapter of Women Grow in Vancouver, and her writing on various cannabis issues can be found regularly on the Canadian resource site Canlio. She continues to consult, lobby and advocate for dispensaries, and currently serves in the role of Government Relations for MMJ Canada. Jamie looks forward to a future where Canada is a leading player in cannabis innovation. She is also a big fan of Beta-Caryophyllene. Marguerite Arnold is an American expat, journalist, technologist and entrepreneur. She writes about the emerging global cannabis space based in Germany for international audiences, and broke multiple stories last year - including on the status of the German cultivation bid. She is also the founder of MedPayRx, a cutting edge, blockchain-based insurtech and digital prescription startup. MedPayRx tracks product from seed through insurance approval, and removes time, paperwork and pain from the process (including large upfront payments by patients). The first iteration is a digital prescription application - the prototype of which is being displayed for the first time at the ICBC in Berlin. Dr. Walter Späth runs an independent lawyer's office in Berlin since 2002 and specializes in banking law and capital market law since 2002. His firm is comprised of five top notch lawyers; focused on commercial law, the firm mainly represents investors in banking and capital market law and in corporate law issues. Beginning in 2017, he represents patients and companies as well as investors from the domestic and foreign cannabis industry, seizing the opportunities of the evolving medical cannabis industry in Germany. Nic is an engaging and dynamic speaker, bringing original content to each speech, custom tailored to each audience. Nic's scientific background, combined with over 15 years of agricultural field and biological experience offers the cannabis industry new possibilities of, productivity, profitability, and professionalism. Over the past nine years - both in Colorado and nationwide - Nic has been asked to speak and keynote at multiple industry conferences and contributes to numerous industry publications . Nic holds degrees in Environmental Studies and Biology, and is a Veteran of the United States Air Force. Even as a student, Tobias Loder was a coincidental participant in the founding event of the ACM (Arbeitsgemeinschaft Cannabis als Medizin) in 1997 in Cologne. Since then, the theme has not let go of him and accompanies to this day. After he set up his own business in 2000 with a large pharmacy and created with this a solid foothold, he tried many things. Often it was an added benefit for the patient in the foreground. Tobias Loader is now again dedicated to his clientele, which he can convince with many and good services which hold them for long time relationships.These include nursing homes and services, many home care patients and, of course, cannabis patients, who are particularly close to his heart because they hardly have a lobby among healthcare professionals. Tobias Loder has worked intensively since last year as an independent consultant with HAPA Medical. Dr. Jokūbas Žiburkus, PhD is a neuroscientist with over 20 peer-reviewed publications and book chapters and entrepreneur. Žiburkus is Co-Founder and CEO of MediTaurus, a holding company focused on research and product innovation and investment in the medical cannabinoid market. He is also Co-Founder of Canntelligence, a cannabinoid education and research company providing high-quality education and training about the known benefits and potential harms of natural cannabis and different cannabinoid preparations. Dr. Žiburkus's expertise is in neurological disorders, where much of his research efforts focused on the mechanism and novel treatments of epilepsy and Alzheimer's Disease, as well as cannabinoid actions in the brain and body. Žiburkus is a recipient of the 2015 Global Lithuanian Leader Award for intellectual capital dissemination and has a proven track record of international leadership and strategic planning. Žiburkus is a recognized public speaker with a widely watched TedX Talk entitled ``There is something you should know about epilepsy and cannabis``. Education and academic positions: Dr. Žiburkus completed his PhD in Louisiana State University Health Sciences Center and his postdoctorate fellowships at Johns Hopkins University Zanvyl Krieger Mind/Brain Institute and George Mason University Krasnow Institute for Advanced Studies. He was tenured as an Associate Professor in 2014 at the University of Houston. Robert W.E. Laurie is an international lawyer, writer and speaker, qualified as a solicitor in England and Wales and called to the British Columbia Bar as a barrister and solicitor. After practicing law in London and New York in the areas of international hedge fund formation and securities fraud litigation, Robert founded AD LUCEM LAW CORPORATION in Vancouver in 2013. Robert's legal practice focusses on cannabis, encompassing business law, administrative and family litigation, plus criminal and marijuana regulatory defense. Robert is also a recent appointment to the City of Nanaimo's newly established municipal Cannabis Task Force. Robert has advised licensed producers, pre-license entities, technology companies, and other domestic and foreign participants in the Canadian cannabis industry in relation to the Controlled Drugs and Substances Act and its regulations, including the Access to Cannabis for Medical Purposes Regulations (the ``ACMPR) and the Narcotic Control Regulations (the ``NCR``). Robert is also helping various industry participants position themselves for expected changes under Bill C-45: An Act respecting cannabis and to amend the Controlled Drugs and Substances Act, the Criminal Code and other Acts, Eliz. II: 64-65-66 (the ``Cannabis Act``). Robert is the Chairman of the Advisory Board of Liberty Leaf Holdings Ltd. (CSE: LIB, OTCQB: LIBFF and FSE: HN3P), a Canadian-based, public company whose focus is to build and support a diversified portfolio of cannabis-sector businesses, including cultivation, value-added CBD/THC products, biotech research and supply-chain products within this dynamic and fast-growing sector. Liberty Leaf also owns 100% of North Road Ventures and acquired the majority interest in Just Kush, both late-stage applicants under Health Canada's Access to Cannabis for Medical Purposes Regulations (ACMPR). Robert is a Special Advisor to the Leadership Team of Hollyweed North Cannabis Inc. and TerraCube International Inc. He is a Director with the B.C. Independent Cannabis Alliance (BCICA), and a former Board Advisor to the Canadian Association of Medical Cannabis Dispensaries (CAMCD). Robert is also a contributing Writer and Columnist with Grow Magazine, based in Oregon. His regular column with Grow is entitled: ``North of the 49th Parallel: Cannabis News and Legal Commentary from Canada``. Robert holds a M.A. (Hons) Juris from the University of Oxford (St. Edmund Hall) and B.A. (Hons) in Political Science and International Relations from the University of British Columbia. Alex joined MedReleaf in 2014 which was the beginning of his career in the medical cannabis industry. Alex was present at the outset of the Canadian Medical Cannabis Industry Association (CMCIA) and during his subsequent tenure he served as committee chair and held the position of interim Executive Director. He has spoken to thousands of patients with various conditions and ailments such as PTSD and chronic pain. Alex has worked with Veterans Affairs Canada on the coverage of cannabis and vaporizers and is a proponent of methods of ingestion other then smoking. He left MedReleaf at start of 2017 and focused on cannabis education by creating a program called ``Cannabis IQ`` alongside MD Briefcase and a faculty of 5 Health Care Professionals. Alex is now the Director of partner development for a new Licensed producer called Flowr out of Kelowna, British Columbia. Dr. Wieland Schinnenburg, MdB, is a member of the German Parliament and a member of the Committee on Health, as well as a spokesman on addiction and drug policy of the Liberal Democratic Faction. Emanuel Kotzian dedicates himself to the education about the effects of cannabis and lobbies for the re-normalization of this classic cultural plant. In 2000, he established Germany's biggest magazine ``Hanf Journal`` and founded Agentur Sowjet GmbH, where he currently serves as CEO. With more than 1 million fans, followers and readers on several channels, Agentur Sowjet is one of the leading marketing companies on the European Hemp Market. Its network of companies and branch offices extends from the Canary Islands to Kiev in the Ukraine and represents a unique platform for any marketing participant. HEAD OF INTL. RELATIONS, BOVEDA, INC.
Benjamin cares for one thing: To secure quality standards for cannabis flowers around the globe. As Head of International Relations for Boveda Inc., the global leader in 2-way humidity control, he is in the center of this movement as water activity is one of the most dominant factors for product quality and safety. Boveda, celebrating over 20 years in business, produces a very natural, reliable, safe and at the same time inexpensive and disposable device that manages humidity levels within any type of closed container. Benjamin looks back to a career as a product marketing specialist and entrepreneur. One of his companies, Noblego, is today one of the leading European retailers of cigars and premium tobacco products. Benjamin lectured at University level, wrote one of the best-selling cigar books in German language and acts as speaker and activist for consumer's rights groups. He now takes his experiences from a highly regulated and well-saturated tobacco market to the uprising cannabis industry. Mary Patton is a seasoned business executive and veteran cannabis activist whose professional career path has taken her from award-winning marketing campaigns, working with clients such as Intel and Sun Microsystems for L!VE Marketing, to high profile entertainment industry positions with KZOK FM Radio, Harpo Studios, Rhino Entertainment, and Amoeba Music, before settling full-time into the cannabis industry with a focus on policy reform and business development. What began as a volunteer passion project in the early 1990s, eventually became a life's mission when she left her career in media, marketing and entertainment, to join top cannabis lobbying organization, The Marijuana Policy Project (MPP) as Director of VIP Relations in 2008. Combining business savvy with her production, marketing and communications skills, Ms. Patton enlisted and engaged high-profile celebrity advocates to speak out on cannabis prohibition, organized star-studded fundraising events and helped to change the social narrative and attitudes surrounding marijuana to advance the legalization movement. After leaving MPP, Mary worked with Gov. Gary Johnson's Our America Initiative, then joined his campaign team on his 2012 run for President of the United States. Since 2010, Ms. Patton has been a sought-after cannabis industry consultant, lending her expertise and advice to cannabis industry start-ups, many of which have gone on to become some of the top companies in the cannabis industry. Colin Bell, Co-founder, co-inventor and Chief Growth Officer at Growcentia. Colin completed his Ph.D. in Soil Microbial Ecology in 2009. As a Research Scientist at Colorado State University, Colin published dozens of peer reviewed publications that were focused on elucidating microbial mediated processes that enhance plant growth. Colin left his academic position at Colorado State University in March 2015 to launch Growcentia. Growcentia is a young startup company in the Ag-Tech sector that develops microbial soil additives that sustainably increase plant yield across many crops. Pete Tramm is a co-owner of Roots Rx, a recreational marijuana dispensary with six locations across the Colorado Rockies. Pete brings 30+ years of growing knowledge to his current profession from his involvement in operating indoor and outdoor cannabis grows across the country for recreational and medical purposes. He has experience working with traditional and alternative growing mediums and running operations that use both natural and artificial light. In addition to the growing side of the cannabis business, Pete has in-depth understanding of the retail aspect from managing stores in Aspen and Vail, Colorado. Once of his more recent undertakings has been working with a state-of-the-art, high-altitude cannabis greenhouse grow that supplies the Roots Rx dispensary in Leadville, Colorado. Pete brings a comfortable and relaxed attitude to a high-pressure industry and his welcoming qualities make him an approachable resource for all things cannabis. Michael Robbie, P.Eng., MBA. Michael is the Director of Marketing with Conviron - the world leading designer/supplier of controlled environments for plant growth rooms in the plant research and ag-biotech sectors having installed thousands of units around the world over the last 50 years. Michael is leading Conviron's expansion into the cannabis sector, leveraging their designs and technologies proven in the precision-based world of plant science and applying them to commercial cannabis production facilities. In 2005, Mr. Nordgren received his education at the University of Texas in Austin, while playing football for the Texas Longhorns football team. As a quarterback on a National Championship winning team, he developed skills that would be carried through his lifetime and core business philosophies. He was the first full scholarship in the NCAA University of Texas football history to graduate with two degrees in less than four years and being accepted into and pursuing a dual Master's Degree program. After playing professionally briefly with the Detroit Lions and Philadelphia Eagles (where he was sidelined with injury), Mr. Nordgren went on to earn two Master's degrees in business and sports management from the University of Dallas. He was subsequently featured on the Bravo TV show ``Most Eligible Dallas``, while becoming a partner in the family business, NORDCO, Inc., a Dallas-based energy conservation firm. This is also when he helped to develop, manage and build his first private equity business/family office, which was a sports and entertainment focused portfolio. Throughout his career, Mr. Nordgren has been appointed to many executive leadership positions at a wide-ranging group of companies and industries. From real estate to sports and entertainment, from hospitality to insurance and financial services, from emerging industries to later stage leveraged buy outs, he is singularly focused on finding synergistic opportunities that have upside potential. He is committed to successfully helping manage the overall financial state of his clients' businesses and the companies with which he and his clients have interests within. Mr. Nordgren is currently CEO and Founder of ARCADIAN Fund and ARCADIAN Capital management, a venture fund focused on the ancillarly service providings companies in and the cannabis and hemp. More specifically, on Series A type opportunities where proven businesses are looking for growth equity to attack and win new markets. He was recently named one of the ``Top 100 Most Influential People in the Cannabis Industry`` by High Times Magazine. Additionally, he is the founder of NORDCO Consulting LLC, a private equity firm dedicated to buying and selling middle market companies with forward-thinking vision. To date, Mr. Nordgren has personally managed over $7 billion in transactions and maintains a portfolio of approximately 25 companies. Inspired by his belief that education and athletics can open doors for at-risk youth, Mr. Nordgren founded The Leadership Foundation - an organization committed to giving back to non-profits whose purpose is to empower youth through sports and education. He feels strongly that young people, regardless of their personal circumstances, should have the opportunity for a bright future and the chance to make a positive impact. Furthermore, he is involved with and contributes to numerous philanthropic causes and remains dedicated to giving back and making a difference. Kris Krane serves as a Principal at 4Front Advisors, the nation's premier medical marijuana dispensary consulting firm that is dedicated to ensuring the highest standards of operations in the industry, and president of 4Front Ventures, a holding company dedicated to professionalizing the cannabis industry. Since forming 4Front Advisors, the company has experienced unparalleled success in helping clients navigate the complex regulatory process necessary to obtain medical cannabis business permits in state regulated markets, assisting clients in procuring forty-four dispensary and cultivation licenses in seven states in highly competitive application processes. Mr. Rascan joins Liberty Leaf with +25 years' experience in the investment brokerage industry, most recently as a Partner, Senior Investment Advisor with Northern Securities. Mr. Rascan's business ranged from active international trading clients to raising capital for junior mining companies on the TSX Venture Exchange (TSXV). Past firms include CM Oliver, Research Capital, Blackmont and Jennings Capital. Prior to his years as an Investment Advisor, Mr. Rascan was Vice-President, Institutional Money Market Sales with ScotiaMcleod Inc.
With an unparalleled level of industry knowledge in the medical and recreational cannabis space both in Canada and the United States, Philip leads all aspects of the Ascent organization. Having previously co-founded a successful entrepreneurial endeavor in the tech space, Philip brings a wealth of expertise to Ascent, including a strong background in business, marketing and essential hands-on experience in the production and engineering side of the cannabis industry. Behind Philip's strategic guidance, Ascent currently boasts cannabis operations in Canada, United States and Denmark. Agrima Botanicals, a federally Licensed Producer in Canada, has three facilities in British Columbia, and European operations headquartered in Copenhagen, Denmark, while Sweet Cannabis operates facilities in both Portland, Oregon and Las Vegas, Nevada. Offering a diverse brand portfolio that includes 8 house brands, 40 unique products and 125 skus spanning the US and Canada, Ascent is well positioned to capitalize on the increasing acceptance of cannabis worldwide. Philip holds a Bachelor of Business Administration with a major in Marketing from Simon Fraser University. If he's not playing hockey or scuba diving in the tropics, you can find Philip in beautiful Fort Langley where he enjoys weekend walks through the old town with his wife and two young sons. Wayne was born and grew up in Jamaica, around Bob Marley and Peter Tosh, as his cousin was Bob's manager. Wayne studied law at Kings College in London and received a Master of Laws in Entertainment Law. As both writer and producer of his first movie, ``Stepping Razor-Red X``, which follows the life story of reggae legend Peter Tosh, Wayne was awarded with a nomination for a Canadian Academy Award, a Genie. Wayne also helped put together the music for the most successful Jamaican film of all time, Disney's Cool Runnings, which was made for $14 million and grossed over $200 million, with its soundtrack going Gold. Wayne helped Adam Sandler put together the reggae soundtrack for his 50 First Dates movie which went Gold and was Number 1 on Billboard soundtrack charts. As a DJ Wayne has performed around the world including Chile, Shanghai, London, Los Angeles, Las Vegas, and Jamaica. Nick Pateras is Vice President, Growth of Lift Co. Ltd (``Lift``), Canada's leading cannabis media, technology and product platform. With a mission to empower informed cannabis decisions, Lift collects and disseminates big data with the goal of bridging the informational gap between buyers and sellers. Prior to joining Lift, Nick spent several years in the pharmaceutical sector with Johnson & Johnson Inc., where he led businesses across OTC and Health & Beauty. His background in healthcare led him to eventually make the professional move into cannabis, having long advocated for recognition of its many medical applications. He holds two degrees, in Business and Philosophy, from Queen's University, Canada. An established, highly successful American entrepreneur and innovator within the Cannabis CBD product space, Jared Berry is currently the CEO of CBDNaturals®. Known as a forward-thinker, Berry founded the first company to develop and introduce a Hemp Derived pharmaceutical-grade 99% pure crystalline CBD Isolate powder to the marketplace in 2011. One year later, his pioneering vision and boldness led to the release of a breakthrough Micro-Encapsulated technology and a time-release effect for CBD absorption that would unlock the topical benefits of this powerful substance including the first ever OTC Compliant CBD Topical Pain Cream. By 2014, Berry was on to his next discovery that would change the landscape of CBD products. He established CBDNaturals® and along with his team introduced Nano Amplified®, the first-of-its-kind Nano technology to reduce CBD particles and encase them in small, flexible, ionic-size water clusters. This enabled Berry to suspend CBD into water for use in Food & Beverages, as well as oral nutraceutical and pharmaceutical-grade applications and opened up new areas of product distribution. With success in hand, he founded Isodiol in 2015 and helped to catapult it to a $400 million publicly-traded company and a market leader in CBD today. In 2016, Berry once again proved his mastery in innovation launching TruSpectrum™, a revolutionary ``true`` Full Spectrum Phytocannabinoid extract that would provide a wide array of phytocannabinoids, terpenes, flavanoids and other powerful consituents as Nature intended without over purification. His keenness in business and marketing, along with his Cannabis knowledge and passion for innovation have made Berry a renowned leader, sought-after expert and innovator across the globe. As such, he developed and launched a non-systemic, topically applied CBD treatment for Autism, Fibromyalgia, and Epilepsy that received ANVISA approval in Brazil. Berry has also helped to launch the world's first ever CBD ``certified food ingredient`` (Humulus (HOPS) derived CBD extract) that is now poised to launch in a multitude of lifestyle products targeting the slow to adopt, highly conservative larger national chains who require certified food ingredients. Jared has been featured and interviewed in various magazines and television programs, and recognized by High Times as an award winner for ``Best CBD Isolate``. John Harrison earned his BSc in Biology from McGill University in 1996. He went on to pursue his doctorate in Neuroscience in 1998 from the prestigious private Vollum Institute in Portland, Oregon, completing his PhD in 2005. During his time as a doctoral candidate, in 2001, the first scientific paper was published demonstrating a functional role for the endocannabinoid system in modulating synaptic function. This also marked the beginning of his personal obsession with the endocannabinoid system and its boundless therapeutic potential. Following completion of his PhD, he went on to work as a Doctoral Research Fellow at the Hospital for Sick Children, where he continued his work studying the nature of synaptic transmission in the central nervous system. Upon leaving academia in 2010, he has remained in the science and healthcare fields working as a medical writer, editor of peer -reviewed Canadian scientific journals, and currently working with special needs children. His hope is to combine his background in biomedical sciences, research and communications to build a bridge between basic research science and cannabis-related advancements in healthcare. With the ultimate goal of becoming an educator and advocate for the continued study of the therapeutic potential of the endocannabinoid system and for the removal of the stigmatization surrounding its medical use. management to solely focus on changing the way the planet feeds and grows itself. Now head of US and Europe operations, Cem is focusing on patented dehumidification, IOT solutions and other environmental technologies. His goal is making Enerama a world leading smart greenhouse solution provider for the cannabis industry. Michael Knodt was born in Hessen, Germany, and has been living in Berlin since the Berlin Wall fell. He initially studied history and journalism before receiving certification as a carpenter. He has worked as a freelancer for German-language hemp magazines since 2004 and from 2005 to 2013, he was the editor in chief of Germany's biggest cannabis periodical. Currently, this father of two writes for Vice magazine,marijuana.com, Sensi Seeds, numerous German and English-language publications. He is also the face and presenter of DerMicha, his new YT-Channel on cannabis and its prohibition. Anthony Johnson, a graduate of the University of Missouri-Columbia School of Law, is the Director of New Approach Oregon, the political action committee responsible for the successful Measure 91 ballot measure that legalized cannabis in Oregon with over 56% of the vote in 2014. He was the Chief Petitioner and co-author of Measure 91 and during the course of the campaign, he helped develop campaign strategy and served as the campaign's primary spokesperson. Anthony is also co-owner of Duff Johnson Consulting, a Portland-based company that helps cannabis businesses with licensing, compliance, and public relations. Clients of DJC include Cannabliss, one of the premier retail operations in Oregon, currently with 5 retail locations; Oregon Natural Roots, a high-end CO2 processing company; and the International Cannabis Business Conference, as Anthony has been helping produce the ICBC since its inception in 2014. Additionally, DJC has an extensive client base on the medical cannabis side as the company assists medical producers adhere to all rules and regulations while providing free medicine to patients in need. 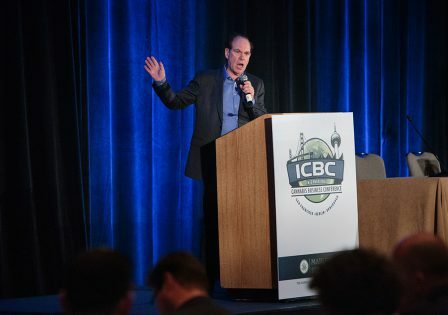 You'll see Anthony on stage quite bit at all of the ICBCs as he frequently introduces speakers, moderates panels, and presents on various legalization topics. Further, Anthony advises politicians and cannabis law reform campaigns across the United States and he was recently published in the book Where There's Smoke: The Environmental Science, Public Policy, and Politics of Marijuana. He also co-hosts a podcast called Let's Hash It Out and blogs at www.weednews.co and www.internationalcbc.com. Chris is a serial entrepreneur and has been involved in several private and public companies since the late 1980's. He was well known for more than a decade as a part-time business commentator in print and radio, as well as an author. He has extensive experience in the capital markets, corporate governance, project acquisition and corporate finance. He is a named inventor on some of Lexaria's pending patents. Farmer Tom is one of the most recognizable Organic Cannabis Farmers in the industry, where his brand and likeness embody a clean, outdoor living and organic lifestyle - fulfilling his life mission. He is a passionate activist, a member of the Washington State Cannabis Commission Formation Committee, and he worked with the Washington State Liquor and Cannabis Board to legalize all concentrates. He is an advocate for creating standards in the cannabis industry to ensure safety and efficacy, and he is the first independent American cannabis farmer to work directly with any federal agency, the National Institute for Occupational Safety and Health (NIOSH). He has also been co-instructing a ``Cannabis and your Health`` course for the last 5 semesters at Clark College in Vancouver, Washington. Vincent and his college roomate Sam started SHO Products in 2015, first offering one product line (Rosin Tech Products - Rosin Presses) and operating out of Vincent's garage. With a strong niche and a growing industry they quickly decided it was time to go all in with cannabis. Over the last two years SHO Products has become the world leader in solventless extraction equipment and concentrate smoking accesories, owns 5 brands of its own in the space (Rosin Tech Products, Pollen Masters, Dab Nation, The Electric Nail, SHO Industries) and holds worldwide exclusive distribution agreements for a variety of related products. The biggest key to SHO Products success is their brand building abilities. In an industry where marketing is difficult, they continue to surprise while showing their skills in successfully marketing and branding ancillary products. This is shown through multiple awards SHO Products has collected around the world at all the major cannabis events (Hightimes, Emerald Cup, Expo Weed) in categories Best Booth, Best Glass, Best Product and Best Vape. A lawyer by trade, an entrepreneur by nature, Max is a Toronto based high-functioning cannabis professional. As co-founder and President of Emblem Cannabis, Max has taken his entrepreneurial passion and love for the plant and transformed it into a successful business dedicated to helping others. Building upon his experience as a medical cannabis patient and his love for the carefully curated cannabis experience, Max is dedicated to cultivating the highest quality, unique cannabis products for both medical and recreational purposes. When he's not busy working with the cultivation, customer care and marketing teams to make the Emblem Experience a truly exceptional one, Max can be found spending some quality time with his wife and two boys. Stephen Verbeek, a McMaster University economics major, has an extensive and accomplished career in cannabis and finance. Stephen is the Business Development Officer for Green Relief, a licensed cannabis producer based in Ontario Canada, with the mission to cultivate the safest, purest, sustainable organic cannabis medicine for patients. He's also the founder and Director of Huxton Black, a financial advisor investment firm utilizing cutting-edge technology and sound personal relationships to help clients meet their financial goals. He's also the founder and Chairman of Hello Cannabis Medical Education Centers as well as founder and President of GR Nurseries and Labs, a licensed producer focused exclusively on medical genetic cultivation and propagation. Dr. Greenspoon's career as a trusted family physician at the Hamilton Family Physician spans over 30 years serving north end Hamilton families. His vision of an integrated health care model, health education and health promotion, while providing quick access to appointments and services has maximized patient experience. Dr. Allen Greenspoon's area of special interest is in Occupational Health. He has been instrumental in leveraging many key partnerships with corporate clients to maintain safe, productive workplaces. A vision to provide employers the necessary services to access medical care quickly has made Wellington Medical Centre, the provider of choice for Occupational Medical services in the GTHA.